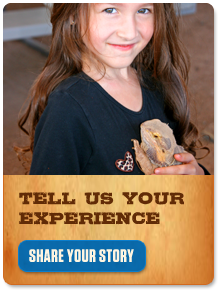 Tambua, a female Gaboon viper, did not call Out of Africa Wildlife Park home until November 2011, a full 4 years after her birth in 2007. Upon her first handling by park founder Dean Harrison, Tambua was uncertain of his intentions, bearing a somewhat defensive posture. And who wouldn’t be after being cooped up in a crate on a 4-hour flight from New York. In Swahili, the word Tambua means “discernment” or “to understand.” Tambua’s name is quite fitting, considering her demeanor quickly changed upon discovering Dean’s goodwill on their first encounter. Now Tambua is as sweet-natured as they come. Still, any handler must be cautious and mindful that this viper is one of the most venomous snakes in the world, regardless of their docile reputation as a whole. The Gaboon viper, the largest of the viper family, is found mostly in central, West, and East Africa, with spotty distribution as far south as Zimbabwe and Zululand. While usually found in rainforests and nearby woodlands, it may also be spotted in thickets, agricultural plantations, swamps, and coastal forests and dunes. The average size is 4 to 5 feet, and occasionally they may attain 6 feet. Females are often longer than the males. The Gaboon viper can weigh up to 18 pounds, making it one of the heaviest snakes in Africa. Gaboon vipers have a unique pattern of colors that range from shades of brown to pinks and purples. The patterns on its body help it stay camouflaged among the leaves of the forest floor. Gaboon vipers have broad heads with horns that become present with age. They’re also known for their large fangs that can reach up to 2 inches in length, the longest of any venomous snake. Females can give birth every 2 to 3 years producing as many as 50 to 60 babies at a time, although the actual number rarely exceeds 25. Gestation takes about a year. Usually they give birth in late summer. Their offspring are between 9 and 13 inches in length and weigh 1 to 2 ounces. The Gaboon viper can live up to 18 years of age. Primarily nocturnal, Gaboon vipers have a reputation for being slow-moving and placid. They usually hunt by ambush, often spending long periods motionless, waiting for suitable prey to happen by. On the other hand, they have been known to hunt actively, mostly during the first six hours of the night. They are usually very tolerant snakes, even when handled, and rarely bite or hiss, unlike most vipers. However, like other snakes when threatened, a Gaboon will rear up and hiss to reveal its fangs to an encroaching predator. The Gaboon has one of the fastest and most lethal strikes of any serpent. Keep in mind that a Gaboon can strike upwards or to the sides as well as forward. This slow-moving snake often crawls in a straight line. They may writhe from side to side when alarmed, but only for short distances. Preferring to ambush its prey, the Gaboon viper lies perfectly still in the leaves of the rain forest and waits for prey to happen by. With the patterns and forest colors of the Gaboon viper, it is virtually invisible as it lies in wait. With the longest fangs of any snake on the planet, it injects huge amounts of venom that kills smaller animals in their tracks. Larger prey will often run away, only to die later and be tracked down by scent. Because of their large, heavy body, the adults have no trouble eating prey as large as fully grown rabbits. These snakes feed on a variety of birds and mammals, such as doves, many different species of rodents, including field mice and rats, as well as hares and rabbits. 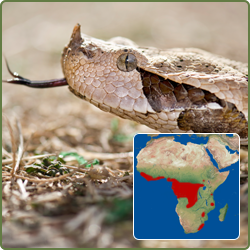 The Gaboon viper is also known as the butterfly adder, forest puff adder, swampjack, and Gaboon adder. Their venom glands are enormous and each bite produces the largest quantities of venom of any venomous snake. Even though bites can be fatal, they are relatively rare, due to the snake’s docile nature and because their range is mainly limited to rainforest areas. Gaboon vipers play a large role in controlling the rodent population in the rainforest. As apex predators they have no regular predators in the wild as such. Their only predators are human hunters. Given their natural habitat condition and diet habits, this species’ status is of least concern from a conservation perspective.